Well, the three Big 3s are now behind us and we are smack in the middle of the 2007 summer movie season. The studios can't expect the massive, record-breaking success that we witnessed in May, but there will still be plenty of reasons for them to celebrate. There is something for almost everyone in June: several more sequels head our way this month, as well as a pair of blockbuster-ready CGI animated stories, some horror, teen adventure, and of course romantic comedy. Which ones will you see? Last year's Cars, the most recent Pixar film prior to this one, was a mild financial and critical disappointment - relative to all the previous Pixar classics. It managed only $60 million in its opening frame (though it did settle in with a fairly respectable $244 million) and then lost to the much inferior Happy Feet for best animated film at this year's Oscars. Many filmgoers have the opinion that while Cars was a good solid movie, it lacked the heart and wild imagination that characterized the animation studio's previous efforts. Was it the Disney influence that had infected the reputable group of animators? Was it just a one-time misfire? Or are our expectations simply too high? I can only begin to speculate on the answers to the first two questions. But the canon of movies that Pixar has also released - Toy Story, A Bug's Life, Toy Story 2, Monsters, Inc., Finding Nemo, and The Incredibles - is nearly untoppable. Most of them are unquestioned classics. The company somehow found a way to make movies that not only appealed to children, but also to adults of all ages. 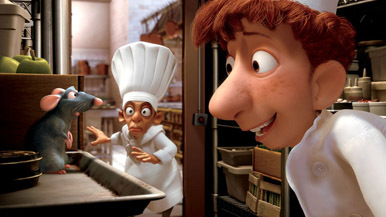 Ratatouille is from director Brad Bird (The Iron Giant and The Incredibles) and centers on a rat living in a trendy Paris restaurant. My only real concern is the title; there is no doubt that Pixar could have come up with something more family-friendly and that the average Joe would be able to pronounce. Opening weekend prediction: $69 million. John McClane doesn't die. He just keeps on living. More than a decade after the third Die Hard flick (Die Hard With a Vengeance), Bruce Willis returns to the lead role as cynical, renegade cop McClane. This time, instead of criminal masterminds like Hans Gruber he is taking on a terrorist group that is threatening to use computers to shut down the country. "Now I have a machine gun. Ho ho ho."